Established in 1941 as Southern Baptist College, Williams Baptist University near Walnut Ridge now bears the name of its founder, Dr. H.E. Williams. The 180-acre campus is located on the fertile flatlands between the Ozark Mountains and Crowley’s Ridge. The college’s facilities have undergone significant improvements in recent years, including the construction of an administration building and a landmark chapel. Most of the other buildings on campus have been extensively renovated since the late 1990s. 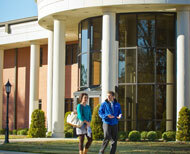 Williams Baptist has an enrollment of about 600 students and is affiliated with the Arkansas Baptist State Convention. The school has expanded its academic offerings. It now has more than 25 baccalaureate majors and broke into the top tier of U.S. News & World Report rankings in 2010. The university’s endowment has grown from $2 million to almost $10 million since 1995. Bucking national trends for small denominational institutions, Williams has seen a marked growth in residence hall population during the past decade. More than 400 students live on campus, almost double the number in 1995. The university’s largest degree programs are in religion, education, business, psychology and biology. In keeping with its denominational heritage and mission, Williams Baptist requires students to complete two Bible survey courses and to attend a weekly chapel service. The university was founded at Pocahontas and moved to Walnut Ridge in 1946. Dr. H.E. Williams was the pastor of First Baptist Church at Pocahontas when he began the college. The school originally offered a two-year liberal arts curriculum, and a majority of early graduates became teachers or ministers. The first support from the Arkansas Baptist State Convention came in 1948, and the college was formally adopted by the convention in 1968. When the college’s principal building burned in December 1946, the school moved to the decommissioned Walnut Ridge Army Flying School. During the next several decades, the college transformed the former air base through millions of dollars of new construction and renovations. The name was changed from Southern Baptist to Williams Baptist College in 1989 and from Williams Baptist College to Williams Baptist University in 2018. Baccalaureate programs were added in the early 1980s.